The Washington Nationals have suffered a huge blow but also gotten a bit of good fortune. 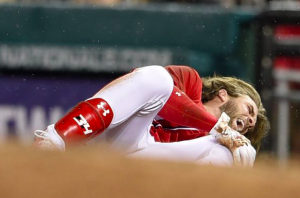 Outfielder Bryce Harper suffered a potentially devastating injury after he slipped on first base Saturday night. However, an MRI revealed that the injury was not nearly as bad as it could have been. The Nationals placed Harper on the 10-day DL Sunday with a bone bruise. But Harper did not damage any ligaments, and so the Nationals don’t believe the injury will be season-ending. Harper appeared to slip on first base as he ran out a ground ball in the 2nd inning of Saturday’s game. The game had been delayed by rain for roughly three hours. After slipping on the bag, Harper planted his leg awkwardly and soon fell to the ground in obvious pain. He was diagnosed with a “significant” bone bruise on his left knee. But the lack of ligament damage makes the Nationals believe Harper will be back before the end of the season. Rizzo is no doubt referring to the rather comfortable lead the Nationals have atop the NL East. Washington has a 13-game lead, and it would take an epic collapse for the Nationals not to win their division for a second straight year. However, Harper is obviously an important part of their playoff hopes. He’s in the midst of another MVP-caliber season. On the season, Harper is hitting .326 with an OPS of 1.034. As Harper lay on the ground Saturday night, the Nationals were nervous at the thought of losing him for the season. Harper’s injury means the Nationals are currently without all three of their opening day outfielders. Adam Eaton has missed most of the season after he did suffer a season-ending knee injury in April. Jayson Werth, meanwhile, has been on the DL since early June with a foot injury. The Nationals are still unsure when he’ll be set to return. Fortunately for the Nationals, Harper going to the DL coincided with Michael Taylor coming off. Taylor missed more than a month with an oblique strain. Prior to that, he was in the midst of a breakout season. Washington has also received good contributions from Brian Goodwin, Adam Lind, and Howie Kendrick in the outfield. With plenty of depth in the outfield, the Nationals should be able to cruise to a division title with or without Harper. But they will need to get him back and healthy before the postseason gets underway. The Nationals are unlikely to be considered favorites to win the National League pennant this year. But Harper is the kind of player who could potentially carry them in the playoffs. The initial diagnosis on Harper is good news for the Nationals. But with no timetable for his return, there has to be some level of concern that he may not be healthy and at his best by the time the postseason rolls around, changing the landscape of the National League playoffs.